Pastor Lethebo Rabalago of Mount Zion General Assembly, in Limpopo, South Africa, has recently been accused of endangering his congregates’ lives by spraying them with insect repellent, as a healing method. Doom is a popular brand of insect repellent with serious adverse effects if inhaled (vomiting, seizures, or the loss of consciousness) or if it comes in contact withe the eyes, but Pastor Rabalago doesn’t seem too concerned about it. 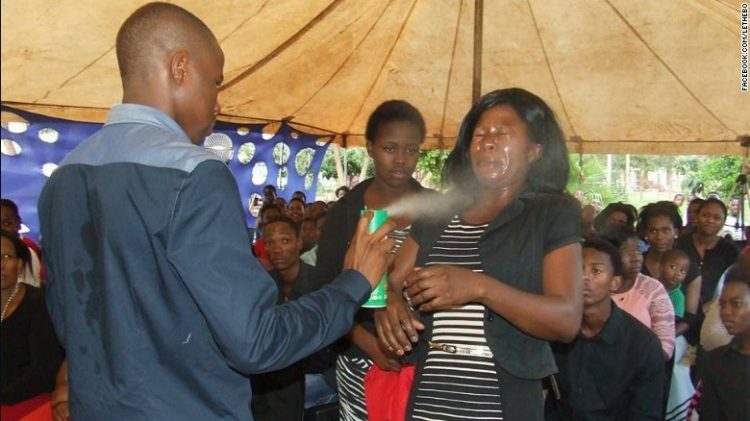 In a telephone interview with enca, the controversial “holy man” admitted to spraying his sick congregates with Doom bug spray as a way to heal them, adding that so far none of them have reported any side-effects following the ritual.